filipinofoodnetwork.com | FilipinoFoodNetwork.com is your first innovative online avenue specifically aimed at promoting our very own Filipino culinary arts, cooks, and chefs. Watch and Enjoy Our Cooking Shows! Unite with Filipinos all over the world for International Adobo Day--let us all cook, share, and upload now! Send your photos to adoboday@filipinofoodnetwork.com. :) SUBO, MGA KAPATID! WE DECLARE JUNE 12 AS INTERNATIONAL ADOBO DAY! Don't deprive the world of our unique culture, especially of Filipino food! Let us all unite with an Adobo Compact! How? ON JUNE 12, LET'S COOK, SHARE, and UPLOAD! - COOK your own version of adobo - SHARE it with fellow Pinoys and other nationalities, and then take a picture - UPLOAD and email it to info@filipinofoodnetwork.com We will feature your pics here on our FB page as a testament to the Adobo Compact! Join us, and join the whole world on International Adobo Day! Let Chef J Domingo show you how to celebrate the blessings come harvest time by whipping up the tastiest dishes from farm to plate. Nothing is wasted or taken for granted here, as all ingredients are given equal importance. What this cooking show will make you realize is that farmers are unsung heroes, toiling day and night to feed not just their family, but the great human family that inhabits the earth. From the creators of Tales From The Friend Zone comes the cooking show of the ages--Tales From the Food Zone! This is dedicated to all who have been friend-zoned, and the millions of Abangers out there. Remember, there is hope. 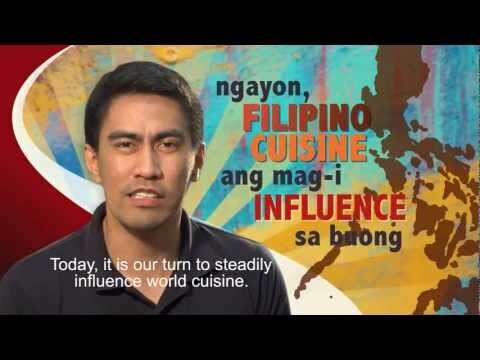 You may not have Ramon Bautista's dashing good looks, but you can learn how to cook. And the way to a woman's heart is sometimes the road less traveled--through her innards. So enough talk, and let Ramon lead the way! Life is filled with different stories all pointing to the human drama--whether it be about love, family, or friendship. In The Mood For Food with Ara Mina gives you the best of these stories tied together with simple-to-follow cooking demos. Watch how Ara's life unfolds and how she cooks her way through the hearts of the people in her life. What is the one thing that HAS to be on the table of every Filipino household during mealtime? You guessed it--sawsawan! See, what's nilaga without patis, what's chicharon without vinegar? And there are so many different types of sawsawan that if you want to learn them all, you've got to watch the cooking show that's all about that ubiquitous Filipino dip--Sawsawan. What is Filipino Food Network.com? Teaser video featuring Chef Gino Gonzalez, Chef China Cojuangco, Chef J Domingo, Ara Mina, Sam Oh, Ramon Bautista, RA Rivera, and food blogger Spanky Enriquez. What Is The Future of Filipino Food? Filipino Food Network.com chefs and hosts give their answers to this burning question. Let Chef Mitchie Sison share time-honored dishes from family cooks. Learn the basics of Filipino home cooking only here on Lutong Bahay. Love to cook at home for family and friends? Love to watch cooking shows? Then we'd like to see YOU cook here on Pinoy Home Cook Videos! Simply record yourself with a camera making a special dish that you'd like to share with the world. You can appear in it as the host, or not. You can record a voice over for it, or not. Whatever works for you works for us, as long as you cook a Filipino dish. If it's a classic, give it your own twist. Or invent your own. Then, upload your video on YouTube and send us the link. If you already have an existing cooking video on YouTube, go ahead and send us the link. We will screen the entries and pick the ones that will go on the show. Not everyone will get in, so make it good! There will be two cooking videos for every episode. At the end of the show's season, we will pick one winner who will get a special prize and the chance to be featured on Filipino Food Network.com. Locally-based culinary students don’t have to go abroad for training under Michelin-star chefs and masterchefs. CCA, Manila has opened its Makati campus that offers Disciples Escoffier Diploma in Culinary Arts. The program is a six-month introductory course developed by CCA, Manila and Institut Culinaire Disciples Escoffier (ICDE) of Hong Kong. ICDE is the professional culinary school of Disciples Escoffier International, a non-profit organization spread in 26 countries and has more than 25,000 members including the world’s most prominent chefs guided by the standards set by the legendary Chef Auguste Escoffier. French Masterchef Michel Portos (right) with one of the students, Jecelle Joi A. Oliva who worked with him during his CCA-Makati cooking demo recently. Chef Michel conducted a cooking demo at the CCA-Makati campus and with Chef Bruno prepared three dishes, all of which were served at one time at his restaurants Le Malthazar and Le Poulpe in his hometown Marseille. Through this innovative program, CCA-Makati endows young culinarians with a strong foundation of French techniques that will propel them towards an international career. Enrolment for the second batch of CCA-Escoffier French cuisine Program is ongoing. Visit www.cca-manila.edu.ph for more details; CCA-Makati is at 139 H.V. dela Costa, Salcedo village, Makati City. The country’s highly successful campus wide culinary talent search, JOLLY University, Year 4 returns on March 3 to be held at Le Pavillon Tent (along Roxas Boulevard). With the theme, “It’s More JOLLY in the Philippines,” the fourth edition is an interactive learning platform gathering top industry leaders and practitioners. This year’s speakers include Leo de Leon, allegro Beverage; Karla Reyes, La Petite Fromagerie; Liza Morales, CCA Manila; Kiam Kazemi, Persian Grille, Marilyn Perion, UCPB; Rebeca Lee, wheninmanila.com; Angela Ong, Miss Earth 2015 and Bryan Ong, Crazy Katsu. The four categories in the culinary tilts are: Individual Category (Luzon Cuisines made easy, healthy and baon-ready); Team Main Dish (Visayan Cuisines Made Easy, Healthy & Jolly); Team Pasta (Mindanao Cuisines made Pastariffic) and Mocktail (Capture the Jolly vibe of the Philippines). Vyin g for the championships are students from Metro-Manila, South and Central Luzon. On top of the prestige and pride of becoming JU student ambassadors, grand winners will receive Php 50,000 worth of cash and prizes, trophies, culinary training workshop under CCA Manila and internship program under Fly Ace Corp.for a comprehensive, job-ready skills development training. Those who wish to join the activities on March 3 may bring any lab el from te wide array of Jolly Food Products distributed by Fly Ace Corp., one of the leading food and beverage companies in the Philippines today. For more details, visit jolly.com.ph. The culinary competition during the Jolly University Year 3 edition (2016). The Philippine Restaurant, Café and Bar Expo (Philresca) with close to 100 exhibitors is set to open on March 1 to 4 at the World Trade Center. It will start with a pre-show coffee event “Re: Verb,” on March 1 organized with the Phil. Asia Conferences and Exhibitions, Inc. and World Coffee Events featuring a series of talks and dialogue with various global coffee experts. Among the speakers are: Sonja Zweidick, two-time Austrian National Barista Champion; Federico Pascas of Café Tuxpal; Michael Cleland of Assembly Coffee and Matt Graylee of Raw Material Coffee. The expo proper starts on March 2 to 4, 10 a.m. to 6 p.m.; the last day is open to the public. The B2B expo showcases suppliers, distributors, manufacturers and service providers in the sectors of baking, café, alcoholic and non-alcoholic beverages, charcuterie, condiments, confectionary, flavorings, spices and herbs, pasta/noodles, seafood, delicatessen and allied services. Also featured are two Philippine coffee tilts: Philippine National Latte Art Championship and Philippine National Barista Championship. The champions are expected to represent the country in coffee competitions abroad. There will be educational seminars as well such as the Cupping Exchange to highlight the best coffee beans and their farmers and the Philresca Sessions to focus on business strategies, products, trends and issues concerning the industry. The sweetness of the blooming sakura (cherry blossoms) is captured in Kitsho’s dessert offerings. After a sumptuous repast in delectable choices of sushi, sashimi, teppanyaki, sukiyaki, tempura, yakimono, hot pots, bento boxes, and/or meal sets, including the buffet spreads, diners would usually need a ‘sweet ending’ to their meals. Flavorful and colorful Kakigori-ca, one of the authentic, “homemade” desserts prepared Chef Hiro at Kitsho. Executive Chef Masahiro ‘Hiro’ Mizumoto has whipped an array of mouthwatering desserts. “All the dessert options are in the new and expanded menu. These concoctions are important to our women guests. And there is much to choose from now.” It is only in Kitsho where you get to sample and savor the very rare ice cream flavors of Matcha, green tea, black sesame, and their own soft-serve blend. “Other delectable concoctions in the dessert lineup include cheese cakes and cream puffs. During our Saturday and Sunday buffets, diners can enjoy bottomless draft root beer and fresh fruit shakes when they add Php 300 to the buffet price of Php 988++, and savor all the iced tea and ice cream they want when they go for the ‘All Drink, All Eat’ meal package of Php1,400++, aside from tasting all the authentic Japanese fare Kitsho has to offer,” adds Chef Hiro. Experience the visual sweetness and daintiness of the spring sakura in any of Kitsho’s delectable dessert offerings. Kitsho is an authentic Japanese restaurant conveniently located at the ground level of Hotel Jen Manila , along sunset strip Roxas Boulevard (across the Cultural Center of the Philippines) in the historic bay area. For inquiries and reservations, please call (02) 795-8888 local 2312 or (02) 994-3623. Here are February sweets from Wicked to help you send your love message. Wicked, a dessert bar and café, can help you express your true love. It offers an array of “sinfully” luscious and melt-the-heart treats that scream, “You are my one and only.” Sounds trite but the sweets, it is a real expression of love. The Signature S’mores Collection from Wicked, a dessert & coffee bar. They are available in heart shapes (big and small). Confess your love with Wicked’s Signature Chocolate Smores shaped into big and small plump hearts. Let your imagination run wild and mix it up with Strawberry and Salted Caramel Smores (small at Php 99 or huge at Php 499) specially made for the love month. The café is designed with love quotes and romantic sentiments to inspire sweet nothings and put the guests in a romantic mood. Wicked is at the 5th level, East Wing, Shangri-La Mall, Mandaluyong City. Check it on FB: www.facebook.com/wickedbycravings. Right in the heart of Manila, you can have a Valentin celebration in a historical house of a lovely, bygone era. Casa Roces, one of the metro’s fine dining destinations, is set in a 1940 ancestral house complete with patterned tiles, vintage chandeliers and photographs ofyesteryears. They are elements that tug at the romantic heartstrings. The “Proposal Room” of Casa Roces—it may be availed of for a special Valentine dinner date. The resto offers a special Valentine menu that is sure to delight the senses—Roasted Red Peppers and Strawberry Gazpacho, Feta Cheese and Sliced Strawberry Salad and three scrumptious mains to choose from—Grilled Shrimp and Steak Scampi, Chicken Valentino and Grilled Sea Bass Gremolata. Perfect ending to the mealis Divine Strawberry and Cream Napoleon. Casa Roces is at 1153 J.P. Laurel cor. Aguado Sts., San Miguel, Manila. For reservations, please call (02) 735 5896 or check out its FB: casarocesmalacanan. Why not take your date to romantic Tagaytay replete with gourmet food? Sisterfields at Summit Ridge Hotel in Tagaytay invites Valentine couples to “A Romantic Episode,” that will allow them to celebrate Valentine’s Day to and enjoy a gourmet four-course dinner amid the scenic views of the cool city. Meal starter is a hearty bowl of Cream of Pumpkin Soup followed by fresh Classic Creamy Coleslaw. For the mains, guests may choose between Roast Pork with Mushroom Sauce or Mashed Potato or Grilled Cobbler with Rice Pilaf and Hollandaise Sauce. A trio of delectable desserts cap the meal—Cream Puffs, Caramel Pudding and Coffee Jelly. The best-tasting Roast Beef, only at Sisterfields in Tagaytay. The perfect dish to celebrate Valentine’s Day. There’s more—after dinner, celebrating couples may unwind at Summit Ridge Hotel’s al fresco area to watch a movie under the stars—complete with popcorn! Gourmet dinner, cool weather and a starry night for a movie date—what more can you ask for? Sisterfields’ Valentine’s set menu is available on February 14, 17 and 18 from 7 p.m. onwards for Php 1,999 net for two. Limited slots available; please call (023) 240-6888 for reservations. It is located at Summit Ridge Hotel, Km. 58 Maharlika West, Gen. Aguinaldo Hi-way, Tagaytay City. Check it out on FB: facebook.com/Sisterfields. At Kitsho, you can indulge in sushi, sashimi and tempura or get more adventurous with king crabs and fugu! If you want authentic Japanese flavors, you need not go far—proceed to Kitsho, the home of Japanese cuisine at the Metro’s bay area. Kitsho means happiness in Nippongo. Try the all-time favorites such as the sashimi platter, moriawase with delectable slices of squid, maguro (tuna), Norwegian salmon and shimesaba (marinated mackerel).Also offered are a wide variety of sushi, tempura, teppanyaki, rice toppings, noodles and more! It also has a sake bar. However, if you are in for a truly exciting gastronomic adventure, Kitsho offers king crabs, also called horseshoe crab and the more exotic, fugu (puffer fish). Kitsho’s Exec.Chef Masahiro Mizumoto, the only chef in the Philippines licensed to prepare and cook fugu (puffer fish). The king crab is best enjoyed either with a dash of lemon or steamed; it is served with a special vinegar sauce that’s a mix of tosazu and ponzu. “The king crabs are plentiful during the winter season; they are meatier and with compact morsels,” says Chef Hiro. It’s best to give the chef three or four days advance notice to account for the king crab shipment from Japan. After the wintry season, both the king crab and puffer fish will be available again in October. And in the Philippines, Chef Hiro is the only licensed chef to prepare fugu which if not properly prepared may be toxic. Chef Hiro earned his degree and license to prepare fugu after an intensive five-year course in Fukuoka (not everybody makes the grade, though). Kitsho is at the ground floor of Hotel Jen Manila; it is open for lunch and dinner from Tuesdays to Sundays and dinnertime on Mondays. For more details, please visit kitsho.com.ph. Kitsho offers a buffet that will satisfy the palate and please the heart. You can rely on Chef Mizumoto Masahiro to whip up a delectable buffet to delight both heart and soul. Start the meal with savory Gyu Tataki or Mozukusu to whet the appetite to follow with Puri-Puri or Garden Salad. Continue the love-spun journey with sashimi (tuna, salmon, white fish) or sushi (tuna, salmon, white fish and tamago) as well as helpings of California Maki, Spicy Tuna Roll and Soft-shell Crab Roll. More mouthwatering delights include Beef Tenderloin, Salmon or Shrimp Teppan and Sukiyaki and Ebi Tempura. Enjoy them with steamed and Japanese fried rice. Cap the meal with assorted fresh fruits and homemade ice cream. Kitsho’s Valentine dinner for two is set at Php 2,140 and Php 1,070 for lone celebrants. For reservations, please call 795-8888 local 2312/2311 or 994 3623. Jolly University champions experience TRUE-T0-LIFE moments that will entirely change their future. Jan Ezra Mendoza (center) of La Consolacion College Manila, the top Cook-off Category winner of Jolly University (Y3), with fellow winners & executives of Jolly food Line and Fly Ace Corp.
Year 4 Challenge features 5 categories: Individual Category (featuring Luzon cuisines made easy, healthy and baon-ready); Team Main Dish Category (Visayas cuisines made easy, healthy and Jolly); Team Pasta Category (Mindanao cuisine made ‘Pastariffic’) and Team Mocktail Category (capture the Jolly vibe of the Philippines in a sip). Fly Ace Corporation , one of the leading food and beverage consumer goods companies in the Philippines, is the distributor of Jolly food products. Visit www.flyacecorp.com for more details. All is set for the staging of the first sourcing platform dedicated to the restaurant, café and bar industry. The expo is organized by the Philippine Restaurant, Café & Bar (Philresca) at the World Trade Center, Hall A from March 2 to 4. The three-day B2B expo is a grand one-stop shop showcasing all facets of coffee, café products, beverages, baking and pastries, specialty food, deli plus allied services and supplies. It aims to advance, match and connect distributors, manufacturers, and service providers to professionals from the F&B and hospitality industry, HRM, culinary, tourism schools and international buyers. Among the guests are: Amy Ball, creative director, World Coffee Events; Federico Pacas, Salvadoran coffee producer and director of Coffee at Café Tuxpal and Viva Espresso; Sonja Zweidick, founder of the female community Barista Connect and two-time Austrian National Barista Champion; Michael Cleland, head of marketing and development, Assembly Coffee in UK and Matt Graylee, founder of Raw Materials and El Fenix, New Zealand. Apart from the expo, Philresca is also hosting the Philippine National Barista Championship and Philippine National Latte Art Championship. The winners in those tilts are sent to world championships to compete among the best in the coffee industry. “The local barista community is very active. Expect to see a lot of our Filipino baristas engaging in leveled up professional tilts, both local and international in 2017,” said May Juan, president, Phil. Asia Conferences & Exhibitions, Inc. Government data shows that this year, the restaurant, cafe and bar industry is predicted to employ 795,000 people. Good Life, one of the leading Asian food brands, welcomed the Chinese Lunar New Year with a lavish foodfest, “Flavors of Fortune: Food Trip Down Chinatown” held at Robinsons Place Manila. “Good Life aims for a holistic festivity to promote a fortune-filled life that include the fusion of good food, good relationships and a good disposition in life,” said Ramon Daez, general manager, Fly Ace Corp. the brand’s exclusive distributor. Good Life food products, distributed by Fly Ace, allow you to transform your dishes from dull to dazzling. Among its bestsellers are pancit canton, sotanghon,egg noodles, sesame oil and oyster sauce. The event featured a live cooking tilt with participants from Hotel Kimberly, City Garden Hotel, Lotus Garden Hotel, Eurotel, Bayview Park Hotel, Amelie Hotel and Best Western Hotel. Other highlights were demos of Chinese arts & crafts such as calligraphy, lantern-making, paper-cutting, fortune-telling, horoscope reading and a talk by Hanz Cua, feng shui master. Good Life offers a wide array of products ( such as vermicelli, breadcrumbs, canton noodles, sesame oil, oyster sauce) that are perfect for Asian cuisine. For more details, visit www.facebook.com/goodtastegoodlife. Welch, the heritage juice brand invites all Filipino families to share all things good. Welch, the choice bottled fruit juice for over 140 years now, brings its new campaign to the Philippines, “Share What’s Good.” Known for its grape juice variant made with 100 percent Concord grapes, Welch has been enjoyed and loved by Filipinos for the past 20 years. In line with its global vision, Welch aims to start a movement that’s all about sharing the goodness of intimate moments and celebrations. Welch juice is also beneficial to one’s health because grapes contain polyphenols, a natural plant nutrient which plays a key role in supporting a healthy heart. To have a less stressful holiday, why not ask Bizu to prepare your Christmas feast? There’s simply too much to do for the holidays. By the time Christmas sets in, you may be all stressed out and tired. Now, don’t let that happen but go have a great feast. How? Bizu has the answers both savory and sweet. *For beef, pork and poultry: Roast Lamb Leg—slow cooked with garlic and rosemary; served with mint jelly and lamb au jus. Porchetta—slow roasted pork belly marinated in garlic, and rosemary; it has crackling skin and a duo of Arugula-Pesto and Apple-Mango Chutney Sauces. Ten-Hour Roast Beef—U.S. Beef Belly Roast with a rich mushroom sauce. Whole Roast Turkey—with Bizu’s signature stuffing of apples, chestnuts, sausages and served with cranberry sauce and pan gravy. A Bizu specialty—Porchetta, slow roasted pork belly marinated in garlic and fresh rosemary. It is served with two sauces: Arugula-Pesto and apple-Mango Chutney. *For seafood: Baked Salmon Rockefeller layered with creamy spinach and topped with rich Mornay sauce. Smoked Salmon Caviar, Norwegian Smoked Salmon lined with dill cream cheese and topped with black caviar. *Amazing cakes: White Truffle Holiday Cake—truffle and honey in between layers of white chocolate. Ginger Bread Cake—filled with cranberries, dusted with cinnamon frosting and topped with gingerbread Christmas trees. Sticky Date Cake –glazed with cherries, dried dates, pineapple, pistachio and topped with white chocolate. Carrot Walnut Cake—just the way you like it. Newcomers—Sticky Buns in walnut/caramel and dark chocolate/orange. New from Bizu—Sticky Date Cake top with luscious cherries, pistachios, dried dates, pineapple and topped with creamy white chocolate. Call any Bizu branch at Greenbelt 2, Ayala Center, Makati (757-2498; 903-6340) or visit facebook.com /ilove bizu. Orders are available for pick up or delivery; no deliveries on Dec. 23 to 26, Dec. 31 and Jan.01. Even if you have to stretch your peso, you can still have a Jolly holiday! Everything is coming up delicious and affordable with Jolly –whole corn kernel, maraschino cherries, cream of mushroom and mushroom variants (pieces and stems, shiitake and whole button) and fresh milk. And with Chef Mitchie Sison’s recipes, you can have your 2016 Noche Buena in a grand style without having to break your budget. Here’s a sample menu from Jolly—Quezon-Butter Corn for appetizer, Garlic Chicken with Gravy Sauce for main and May-Ry , Cheery Orange Mocktail. In a pan set over medium heat, melt butter. Toss in Jolly Whole Corn Kernels, salt and pepper and half of the grated cheese. Cook over medium heat for 3 to 4 minutes. Transfer to a serving dish. Top with remaining grated cheese and green onions. In a bowl, season chicken with salt and pepper. Refrigerate for 30 minutes. In a large skillet set over medium heat, melt 2 tablespoons butter. Pan-fry chicken until all sides are brown. Set aside. In the same skillet set over medium heat, melt the remaining butter and sauté garlic until fragrant. Add Jolly Mushrooms Pieces & Stems and Shiitake Mushrooms. Cook for 5 to 6 minutes. Stir in the chicken stock, Jolly Cream of Mushroom Soup and soy sauce. Let simmer until thick. Return the pan-fried chicken to the skillet. Spoon the sauce over the chicken pieces. Cover, reduce heat to low. Let simmer for 5 to 7 minutes. Transfer to a plate and top with chopped parsley. Applying the American Hotel and Lodging Educational Institute (AHLEI) principles of educate, develop and certify, Asia World Hospitality (AWH) held a Certified Guests Service Professional (CGSP) workshop recently at the PHINMA Education-University of Iloilo. It targeted hospitality industry practitioners, educators and learners. The three-day workshop was attended by 27 fourth year students of the University’s HRM College. The workshop had an entry-level approach suitable for HRM students who want to enhance their knowledge and understanding of the field. The participants learned the best practices and principles derived from actual scenarios and experiences enclosed within the AHLEI and AWH programs. The workshop also included the seven Elements of Guest Service Gold—authenticity, intuition, empathy, champion, delight, delivery and initiative—beneficial to and of good use to the attendees’ day-to-day dealings with people. Upcoming events of AWH: Certified Hospitality Educator workshops—January 18 to 21; 23-26 & 28-31, 2017; Certified Hotel Administrator workshop: February 1 to 4, 2017. For more information, visit asaiaworldhospitality.com or call 556-7994. Home Foodie shares delicious recipes for people on the fast track. Welcome 2017 with easy-to-do and super delicious recipes courtesy of Home Foodie and the San Miguel Pure Foods Culinary Center. No matter how busy your schedule is, you can prepare these recipes ahead of time in minutes, pack and eat them directly in mason jars. Note well, however, that they are best eaten on the same day. Prepare a 350 ml mason jar. Arrange ingredients according to sequence. Cover tightly and refrigerate until ready to serve. N.B. To prevent lettuce leaves from wilting, mix sauce only when about to consume. Bake the Magnolia banana cake mix according to package directions. Cool. Prepare 3 pieces mason jar (350 ml capacity). One jar per serving. Crumble banana cake and 1/3 of a mason jar. Mix oats with yogurt and milk. Pour into jar until 2/3 full. Top with banana slices. Keep refrigerated until ready to eat. If desired, top with chopped walnuts or almond slivers. N.B. Dip or brush the banana slices in lemon, lime juice or other acidic fruits to prevent browning. The new Doña Elena 100% Tuna in Sunflower Oil makes your dishes both festive and healthy. With Doña Elena’s products , you don’t have to compromise yours and your family’s healthy lifestyle even with the indulgent meals this Big Season. As a holiday treat to Filipinos across all ages, Doña Elena unveils its 100% Tuna in Sunflower Oil in Chunks and Shredded. It’s great for staples like pasta and stew up to dips, stuffings and spreads. It’s made from 100% tuna meat with no extenders , preservatives and MSG. The latest product line of Doña Elena has several nutrients: omega-3, protein, selenium, vitamin D vitamin E, polyunsaturated fat of the cholesterol-free sunflower oil and omega-6 fatty acids from tuna itself. Other Doña Elena products you’ll love are Al Dente pasta, olive oil and Spanish Sardines. Heat pan with Doña Elena olive oil then add onions, bell peppers and zucchini. Saute until onions are fragrant. Add the Doña Elena diced tomatoes, black olives and capers. Simmer until slightly thick. Season with salt and pepper to taste. Set aside. Transfer sardines in a bake proof small casserole. Top with tomato mixture, goat’s cheese then the raw egg. Bake at 180?C for 5 to 10 minutes. Top with chopped parsley before serving. Sparkling juices from Welch, the perfect beverage for a joyful holiday. This Christmas and up to the New Year, add more sparkle to your celebrations especially with your family and friends with Welch’s non-alcoholic beverages. Welch’s is the world’s favorite grape-centric food and beverage brand and now, it brings its line of sparkling juices to Filipinos, young and old alike. There are 12 non-alcoholic sparkling juice variants to choose from—White Grape Sparkling Cocktail, Red Grape Sparkling Cocktail, Blue Grape Sparkling Cocktail and Cranberry Sparkling Cocktail. Other favorites are Cherry Limeade, Mango Passion, Strawberry Lemonade and Raspberry Limeade. The latest from Welch is its line of sparkling mocktail products—Strawberry Daquiri, Sangria, Piña Collada and Mango Bellini. “Welch’s sparkling grape juices are made from 100 percent Concord and Niagara grapes grown by nearly 1,000 family farmers in the United States and Canada. By making Welch’s line of sparkling juices available in the Philippines, we are providing inclusive and nutritional choices for Filipinos to enjoy this Christmas,” says Jun Cochanco, president of Fly Ace Corporation, the exclusive distributor of Welch’s in the country.